What's funny is that even before I knew Chiang Mai would be in my future, I was already designing my living room around it. It started with my obsession for the color green...followed by the pairing of said green with aqua...followed by touches of orange and navy. 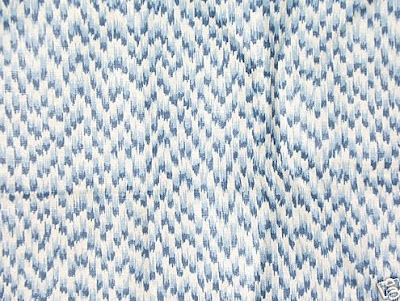 It's as if I was willing my room to morph into some echo of this iconic fabric. And now, I actually have this fabric to pull all of the colors in my living room together. I will be using it to cover the seat of a white cane chair that sits in our living room (I will also make a matching pillow for the back of the chair). Now that I have my dominant fabrics covered (Chiang Mai and Sassari Ikat), I am looking for accent fabrics to make some additional pillows to litter the sofa and armchair in the living room (I mean litter very lovingly...Carter would actually mean it as litter...he's not too keen on pillows). Loved the small-scale pattern on both to juxtapose with large patterns on my dominant fabrics. Each remnant is just big enough for a pillow front - so I'll back each with a coordinating fabric. And each was under $10 bought from this eBay store. Pictures to come once the pillows are complete...I'm thinking some pom-pom trim needs to be involved. Beautiful fabrics. Men don't get pillows, do they? It's going to look great. 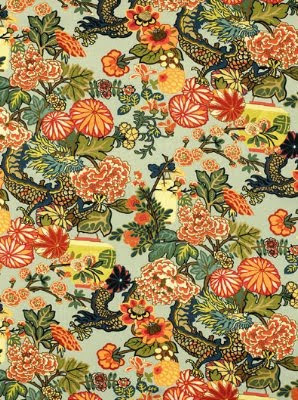 Chiang mai dragon will always be one of my favorite prints! I love the accent fabrics you got as well. My husband doesn't understand pillow as well. They drive him crazy. He is constantly throwing all of our toss pillows off the bed! New to your blog and I must say I'm in heaven. It's just wonderful! Plus my little sister's name is Daniela! I've never "met" another Daniela before! Welcome and thank you for the kind words on the blog - I have checked yours out as well and love it! Daniela, question... how do you search for fabrics on ebay? Do you already know what you are looking for (like you've seen it somewhere else) and you're just trying to get less than a yard for a better price? Or do you use search terms? HELP! Fabric is so overwhelming, but I would love to be more savvy in this area! Just FYI, Horchow is having a sale right now on their already-marked-down clearance items. You have to enter the word SALE at checkout to get an extra 25% off and free shipping. Daniela, there is a set of three shiny black trunks in varying sizes with gold Chinese emblems that you might like. When I search on eBay, I typically start with a manufacturer's name (like Schumacher, Cowtan, Lee Jofa, etc). If not, the results I get back are WAY too long and not targeted, and I value my sanity a bit too much. I'll compile a list of some of my favorite search terms and post them on the blog! I love all of these fabrics together! 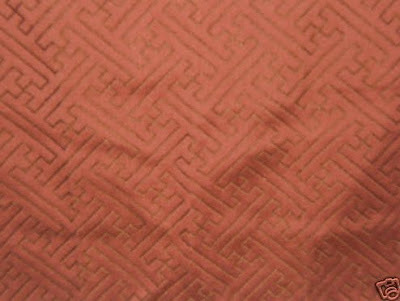 The Lee Jofa is particularly fabulous and I think it's going to be stunning with the Chiang Mai. Can't wait to see the finished product.